Having said that, I would like to see us putting more effort into perennial crops. These have to be high value, low volume and with an Asia focus. At a big-picture level, the rest of the world outside Asia either does not need us or cannot afford us. The first technical challenge is how to deal with urinary-N leaching. We have the science to solve that. More of that below. The second challenge is greenhouse gases. This one is tricky. The starting point is to go back to the system dynamics of short versus long-lived gases. As long as we focus on the greatly flawed notion of CO2 equivalence, then we will not find the path. I have written of that before [https://keithwoodford.wordpress.com] and at some time will do so again. Not sure who wrote the headline, Keith, but I don't think there is an "environmentally friendly" path for much of our intensive dairy farming. Don't you think we need to face this reality, particularly in light of the debt situation? Surely downsizing/restructuring by way of reduced overhead/costs will become a necessity for the over indebted. It has always been that way for other industries. We could toilet train the cattle then install lifting stations and all new sewer laterals/trunk mains from the farms to the nearest Wastewater Treatment Plants. One of the pleasures of writing for Interest.co is that David C does not impose titles. So I take responsibility for this headline. I agree with you, Keith on the de-intensification issue in some geographic areas. In those places, dairy farming as an activity simply should be prohibited altogether. Great article, as always, KW. The debt issue is surely the main impediment to uptake of the composting-barn system (indeed, of any other capital-intensive measure), and those urinary-N reductions are quite startling. I applaud your drum-beating to offset the negative externality-narratives espoused by our Urban Chatterati. Every little helps. Yes, just build bridges over the slime and get on with life, eh? From your article link; director of environmental quality Gary Bedford said algae was essential for aquatic ecosystems to grow and thrive Maybe us humans need to get over our demand that waterways have to exist to serve how we would like it rather than how it is best for nature. Shallow, low flow water, in times of warm weather develop algae. If you understand climate change then you will understand warmer weather will equal more algae in shallow, low flow waterways. If 400 people were to be walking through that waterway there should have been a bridge over it - algae or not. Yes, he did say that - it was laughable. A bit like saying that obesity in humans is a natural thing as well, given food is essential for human flourishing. 3kg/ha is a fantastically low figure Keith, but two of the other "elephants in the room" are 1) the level of the "brains trust" on each farm, which unfortunately is getting lower and lower which makes it difficult to get super positive about this type of system, specially when they involve staff that arent family, and 2) the very high average age of farmers and the lack of a viable system for young blood to get into their own land (unless of course land values "tank" back to 1980 levels). Unfortunately the dairy industry has lost sight of all of this and the chickens are now coming home to roost. Its going to take either a massive lift (that is consistent) in dairy payouts or a complete turn around in industry behaviour where we focus on the long term rather than the short term fix that results from carrying very high debt levels, this would require massive Government Support. All industry participants will need to buy into the new game which I suspect will be smaller "quarantined" family operated farms with either composting or freestall sheds and cows producing 5-600kgms through either 100% Autumn Calving or Split Calving (for higher value milk). This system will require a substantial Capital Injection as well as a large IQ adjustment, however at present payout levels and the payout trend over the last 10 years it is difficult when putting the "investor hat" on to break a smile on the weathered face of some of us grumpy old farmers. Thanks for your continued positive advocacy for the dairy sector, we need more like you at the moment! I travel around canterbury farms and as yet I haven't seen any that could be called sustainable and that is without calculating the debt in the system or the old farmers. They have reaped what they sowed migrant labour to keep wages low and massive debt bidding up land prices on some expectation that china will always want our milk. The Canterbury Plains is one of those areas that dairying should have been a prohibited activity from the get-go. Blanket statements like 'dairying should have been a prohibited activity from the get-go' ignore the huge variation in soils, altitude, rainfall, ground slope and other physical characteristics of the 'plains'. Sweeping generalisations are no basis for land-use policy. Which plains were, themselves, the result of early human modification: the lowland forest cover which was 100% (Tangata Whenua has a map referencing precisely this) was burnt to a crisp by the moa hunters in the early 13th century.... in fact most of the East Coast of the South Island was similarly burnt. When humans arrived c. 750 years ago, they instigated a period of deliberate burning that led to the loss of nearly 50% of New Zealand´s forests. Astonishingly, it appears this was caused by very few people - probably only a few hundred individuals in small transient groups - yet they were able to initiate widespread and permanent forest transitions to open vegetation. So land and thus climate modification is, we can cheerfully say, an ancient and revered activity. Sweeping generalisations are no basis for land-use policy. Yes, I agree, which is precisely why the sweeping generalisation of 'rural' zoning has served us and our environment so poorly under the RMA. Did you read the article in 'Australian' 5 days ago about 'China may turn sour for infant producers A2 and Bellamy's. be keen to hear your views on how the market is being manipulated. I don't think that particular article in the Australian was quality. One of the remarkable things about the Chinese infant formula regulations in the last ten years is that the Chinese have not done anything they did not flag well in advance. All businesses have risks but A2 seems in a good space as it satisfies the criteria which the Chinese regard as important. I have always been cautious about Bellamys and I still am cautious.But I do watch them with interest. The worrying issues for both companies relate to the extent that NZ and Australia get caught in political crossfire. NZ has had a special relationship with China for many years and that relationship has been very much to our advantage. Thanks for responding Keith. Great to have a knowledgeable guest taking the time to engage in the comments section. NZ has a special relationship with China. 10 social credit points to Keith. You really think that will matter two hoots if if we don't let Huawei back in... or we start questioning their $$ influence via the back door? Special relationship as long as we stay onside. That's it. It is not as simple as whether or not we let Huawei back in. Since Fonterra have abandoned the Rochedale principles and ceased being a co-operative, maybe there's opportunity for an actual dairy co-operative with a focus on sustainable / low-impact farming to emerge. There is indeed an argument that the diversity of interests of NZ dairy farmers is too great to be managed within a single co-operative. Tatua is a good example of how small co-operatives with very modest scale but with strong common interests of members can prosper. It is interesting that new dairy co-operatives have not emerged - all of the new dairy processing and marketing entities have been investor-orientated. Very true Stuart. Non supply capital is king in Fonterra now, with the milk price manual proffering a mechanism to minimise value/price of on farm milk, and any 'profit' increasingly going to non-farm investors. Keith, what is the additional benefits to having an off-paddock wintering solution? I am thinking less damage to paddocks and races. Also, more controlled BCS spread across the herd? How does it affect animal health? The animal health effects will depend on the specific situation. As a very general statement, the health issues with off-paddock wintering are different but not necessarily better or worse. 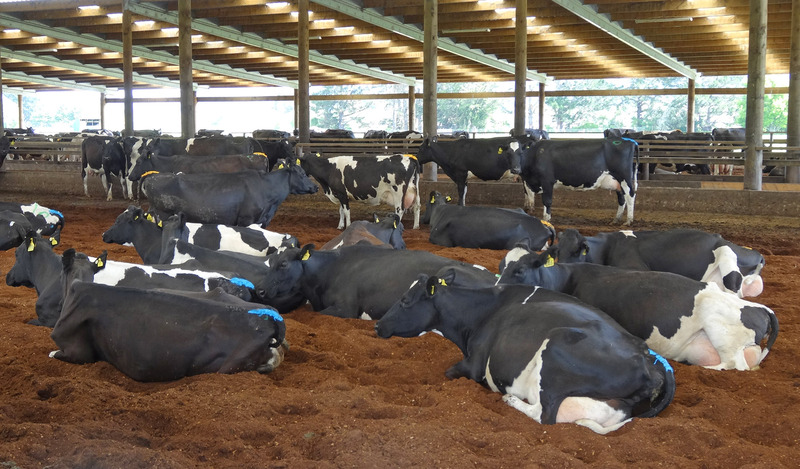 The key issue with any off-paddock system is that the cow must have soft dry bedding and be able to exhibit normal animal behaviours. If those conditions are met then animal health outcomes should be very good. If those conditions are not met then the outcomes can be bad. ...our national wealth depends on the two pillars of dairy and tourism. Got a more recent update Kate than a 7yr old article? Any business that has an income drop of around 68% but costs the same or more, wouldn't be paying much tax. Bernard rebuts that "this is just a one-off after a bad year" claim in the comments. I laughed to see you and me there all those years ago too... plus ça change, plus c'est la même chose. When interpreting dairy industry statistics re taxation, it is important to recognise that the operating entity will typically be a company, and this has an industry association. However, in the final wash-up of transfers between entities, most of the profits are actually earned and the tax paid by other entities - typically trusts and individuals - which typically do not show as being dairy industry related. I'm not taking the time to look myself but it would be interesting to see a complete assessment of water on farms and the water outputs as well as inputs. Someone smarter than me could present a complete picture with some pretty graphs. Correct Ahuhyeah. I'm not able to give you the answers but in Southland 57l/cow/day for stock drinking water is what is used by regional council for dairy water permits and 70l/cow/day for all dairy shed water - cleaning plant which has to meet food hygiene standards and washing down cowshed yards etc. This may vary slightly especially the 70l/day between regional councils. The 70l/day is almost all captured and piped to effluent ponds which is then irrigated on to pasture - the 'effluent' you see being irrigated is actually mainly water from the shed washing down processes. The important thing to note is that just because a Regional council has issued consents for x cubes of water doesn't mean that the farmers are actually using x cubes of water, it may be quite a bit less on a regional cumulative scale. Kate - And then there is this: "Wellington's estimated non-commercial water consumption is typically about 350 litres per person per day. This figure is based on total water supplied, less the metered commercial use, divided by resident population. Because this figure can be affected by changes in resident and Council activities, it is used when measuring water usage trends as part of managing water demand." Fraser and Dewes in your link used 80l/pp/day as their basis. Our 50 sq metre fruit and veg garden uses about the same. Recycled newsprint and cardboard are worth virtually nothing at the moment,I wonder if they can be mulched for bedding material. I would think the feed requirements for a cow on warm covered bedding would be lower than been outside on a frosty night. I have seen YouTube videos of closed loop systems where the air from the cow barn is fed to a glasshouse, where the plants benefit from the higher co2 and methane . Of course even more capital costs, but then again, glasshouses are been built anyway. It is interesting that the cow water use and the person water use is similar. We could add the 5 million cows to the 5 million people to calculate a combined environment loading. And then there is Hort of course. Cows don't have showers , baths or use flush toilets . A cow could drink 40 litres-60 litres on a hot day , a human probably lucky to drink 2 litres. I appears the cows have 140 litres a day, some of which ends up as irrigation and produces food for them. We beings seem to use 70, mostly for sanitary but we should for comparison add the water used to produce our food. For this household on our diet my guess is 70 litres pp/day, only a guess, we are not big meat eaters. Possibly the point is that’s cows and people put similar demands on the environment and that includes the destruction to the river systems. It appears shelter could be helpful in Sumer as well.